I'd been hoping against hope that we might not have to suffer through a mid-season hiatus with The 100. Unfortunately, I was wrong - next week's episode is the mid-season finale. I can't find their midseason schedule yet, but I'm assuming the hiatus will be three months, which means it will be back around March (please, no longer! Please, please, pleasepleaseplease). The episode opens with a girl lying in the grass. She sits up and, with the mountain backdrop and her faded floral dress, it looks like a scene from the Village - until you see a camera watching her, recording her movements. Her name is, apparently, Keenan Mykulak. I don't understand this. 'Keenan' is an Irish boy's name, and Mykulak is Czech. She's a girl. Without an accent. So she's an American Irish Russian girl with a boy's name. I'm nitpicking now. Onward. ...until, of course, we go inside and see Dr. Tsing (Singh? Seriously, what is it?) and Cage watching her from a camera inside. Naturally. They remark this is the longest anyone has ever been able to stay outside, but the experiment isn't entirely successful - they watch as Keenan's skin begins to burn from the radiation and she pounds on the door, begging someone to let her in. Cage moves to let her in, saying she's in pain, but Dr. Tsing-Singh tells him no, they can't - she'll tell other people. For a brief, brief moment I thought Cage was going to disobey her, but no. They're both evil, he's just slightly less. He's only 99% evil. Cage: "The blood of The 47 could be our permanent solution, that's what you said." Dr. Tsing: "Science takes time, Cage. There are dead ends and blind alleys on the path to every breakthrough." Cage: "You call that a blind alley? She's one of us." Dr. Tsing: "No, of course not. I call that sacrifice… for the greater good." This provides an interesting parallel, however. Under the ground, Dr. Tsing-Singh and Cage are willing to sacrifice 47 innocent lives so the rest of their people can survive. On the Ark, just months before, Chancellor Jaha sacrificed quite a lot of people so everyone else could live. The difference, of course, is that the people on the Ark volunteered to save their loved ones, while the 47 are unwilling victims. Doctor Horrible tells Cage that while the blood of the 47 isn't a permanent solution, their bone marrow might be. Let's drill right to the source! (Pun intended) According to her, it will kill every single one of the kids, but it will be enough for everyone else. Now it's up to Cage to convince his father that it's a good idea to move forward with the plan. Cage goes through with the plan in a surprisingly...poignant way. He takes his dad outside and they breathe the fresh air and have a moment of enjoyment, before Cage tells him they need to go back inside. Of course, naturally. Cage informs his dad that if they want to be able to stay outside, they need the bone marrow of the 47. I can understand where their heartache comes from - after all, they've been underground for nearly 100 years, and now they have a chance - barbaric, evil, but a chance - to be able to live on the surface. And not just them, but the generations after them. This is the answer they've been looking for. But President Dante, who seemed evil at first but is turning out to be at least the extremely lesser of the two, tells his son, "We are the keepers of history. What we've done to the outsiders has corrupted our legacy. I can't go down that road any further." Unfortunately, Cage and Dr. Tsing-Singh are very willing to go behind Dante's back to get what they want, as we see at the end of the episode. Monty, Jasper, Miller and Harper (Yes, we finally learned her name in this episode! Did we see her earlier in season one? Or two? It doesn't matter; I'm going to call her Crewman #6) come up with the idea to sneak into the President's office for a way to escape. While I love their faith in Clarke, I'm glad they realized they need to take responsibility for themselves and get out of there. Monty gets them into the office while Crewman #6 watches the hall and they dig into the President's computer. Amid some helpful information, they discover drone images captured of the Exodus ship - and their people, alive, on the ground. and tells them that the people are getting restless, and they need a word from their Chancellors. Uh, from which Chancellor? Because now there are two of them. Technically three, if you count Kane, whom we haven't seen all episode. Nor do we. Kane? You okay, buddy? For the first time in the series, I'm glad Major Byrne plays by the rules. She tells Jaha that Abby is still acting Chancellor, therefore, she gets to make the decisions. Abby tells everyone to stay calm and get prepared to leave, and Jaha is unhelpful. While this scuffle is going on, Bellamy shows up. Bellamy tells Clarke that she needs to come to the drop ship where they have Lincoln chained up. Again. This feels very familiar, but of course, that was before they were all friends. Like now. Lincoln is, of course, a bit less friendly than usual. Things are made worse by the fact that since Octavia shot him in the leg, Clarke needs to remove the bullet. Unfortunately, enraged and drugged, Lincoln calls upon the forces of Krypton (kidding), breaks free of his restraints, and grabs Clarke. Clarke fights back but is unable to free herself, and Bellamy puts up an excellent fight (seriously, Bonnie Tyler's 'Holding Out For a Hero' just came on my iTunes. The universe is rife with truth - Bellamy is a hero) but Octavia finally knocks Lincoln out. They get him strapped to the floor and Octavia leaves to get water for him, but she sees a flower stuck on a tree. This was the signal Lincoln used to use when he wanted to speak with her and so naturally, she heads toward it even though Lincoln is currently convulsing in the drop ship behind her. Nyko tackles her, the n proceeds to tell her that the scouts are already at Camp Jaha and she needs to leave. Octavia tells him about Lincoln. He tells her he can help and since he's a healer, and Lincoln's friend, she believes him. Nyko goes inside, takes a bottle out of his belt, says something in Grounderese, and proceeds to release the world's slowest drop into Lincoln's mouth. Fortunately, Clarke recognizes the Grounderese as what Anya said right before she died, and catches the drop before Nyko kills Lincoln. (Octavia! You were supposed to pay attention during language classes, not gazing into your boyfriend's eyes!) Nyko admits he was going to kill Lincoln, but he tells them there's no way to cure a Reaper. Finn enters right on cue to tell them Camp Jaha is packing up to leave. Finn's cue: World's Worst Timing. Oh, Finn. You upset me. Another fight breaks out because Finn's very good at starting fights, and in the middle of the commotion, Lincoln stops breathing. Nyko watches in shock as Clarke brings him back to life with chest compressions and says he's never seen that happen before. Clarke realizes this could be a way to stop the war - if she tells Lexa they have a way to turn Reapers back into Grounders, they might be able to have peace. Yay, peace! Clarke returns to Camp Jaha and presents the idea to her mother. Abby thinks it's a good idea, but before they can go through with it, they see torches outside letting them know that the Grounders have arrived and they have less than two hours to get out before they're attacked. Jaha tries to convince Abby that they don't have time to think about this, that they need to leave, but something miraculous happens. ABBY LISTENS TO CLARKE. FOR THE FIRST TIME IN FOREVER, SHE FINALLY UNDERSTANDS. FOR THE FIRST TIME IN FOREVER, THEY'LL DO THIS HAND IN HAND - okay. Enough. *whispers* Abby listened to Clarke. Jaha loses it a little and rants at Abby, who keeps calm and, at the end of the tirade, asks, "Are you through yet?" Jaha, none too pleased, orders the guards to arrest Abby. Abby tells the guards to arrest Jaha. Byrne arrests Jaha. I never thought I would a) cheer for Byrne or b) want to see Jaha arrested, but WOOOOOOOOOOOOT!!! Major Byrne, thank you, for the first time. Ever. Thank you. When Jaha asks Abby why she's doing this, Abby tells him it's because she has faith in Clarke. Awww!! Finally. I could practically hear violins. It was a concerto. They come up with a plan - Abby will go with Finn try to help Lincoln at the drop ship while Clarke proposes the treaty to Lexa. Clarke is taken to Lexa's tent (the Grounder Queen doesn't camp out. No. She glamps out.) and Lexa listens to the proposal. Clarke tells her that Anya was going to make a peace treaty. 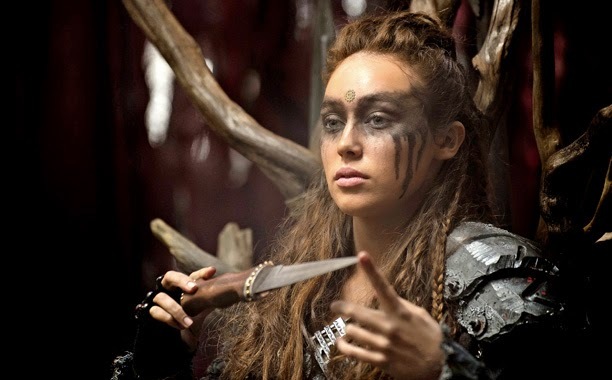 Lexa and her second, Indra, are skeptical, but Clarke whips out Exhibit A - a braid from Anya's head. When did she get that? Why did she take it? Was it on a whim? Has she just been carrying it around with her? Lexa agrees to go with Clarke, and they head to the drop ship. Unfortunately, Lincoln has stopped breathing again, which isn't going to look good when Clarke and the Grounders arrive. Abby tries to give Lincoln CPR but gives up when it doesn't work. Clarke and Lexa arrive, and Lexa sees Lincoln's body on the ground while Bellamy tries to comfort Octavia, who promptly collapsed into a heap of tears. WWIII nearly breaks out when Abby grabs one of the shock batons and electrocutes Lincoln, who wakes up. HE'S ALIVE! IGOR, HE'S ALIVE! YOU GO, ABBY. Wait. Lexa isn't finished. "I just need one thing in return. Deliver me the one you call 'Finn.' Our truce begins with his death." Okay, I have to be honest. When Lexa said that, my sister and I both said, "TAKE HIM." We aren't Finn fans. He gets in the way of Bellarke. But he's been heavy on the Puppy Dog Face/Eyes the last two episodes and I think it's starting to make me feel sorry for him. He even had a little almost-apology for his little massacre. Awh. I don't like you, Finn, but I don't necessarily want you to die. Although, honestly, I don't want a whole episode about him, which the next episode (and winter finale - GAAH) is, if we're to go by the title "Spacewalker." Although it's very like the CW to give us an episode all about someone's backstory, right before they KILL THEM. WHICH WOULD BE OKAY. RUN INTO BELLAM'YS ARMS, CLARKE. YOU LIKED IT THERE, REMEMBER? During the end scene, we see that Dr. Tsing-Singh and Cage have captured Creman #6. The poor girl is strapped to a table, awake and struggling, while they assure her it 'won't hurt a bit.' That is, of course, before they start drilling into her hip, and the episode fades to the sound of her screams. WOW, MOUNT WEATHER. JUST WOW. a) how on earth does Dante's computer still work? It's 97 years old! It moves faster than my four-year-old laptop! b) what would be proper justice for Finn? c) what do we call Camp Jaha now that we know he's actually alive? e) is Cage going to kill President Dante? f) do you think Finn is going to die in the next episode, or will they shock us with the death of someone else? g) if it's Bellamy or Clarke, are you prepared to storm the CW castle with me? a) seriously. we have a 1998 computer somewhere that can barely turn on. c) lol and arrested. :P slight awkwardness. e) I wouldn't be surprised. maybe Dr. WhateverHerNameIs will do it instead. Isn't it the sane principle as a defibrillator? OOH, this is really good to know o.O WRITING INFORMATION. WE HAZ IT.